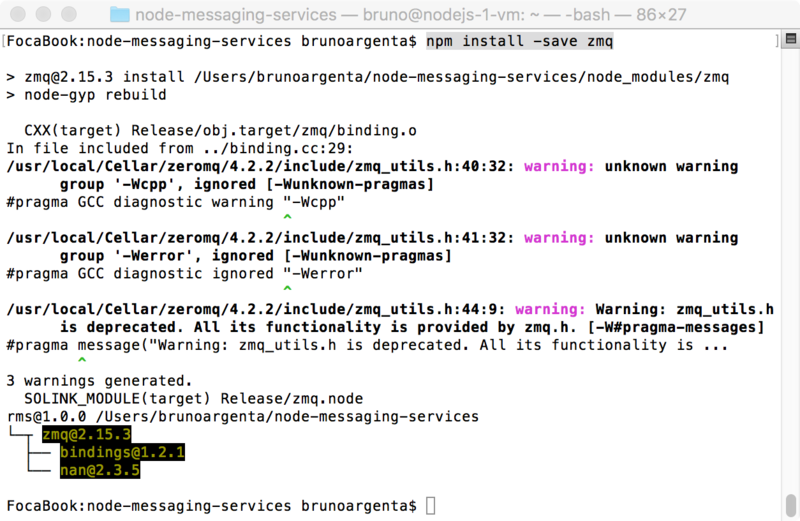 Get to know how to use messaging services using nodejs. 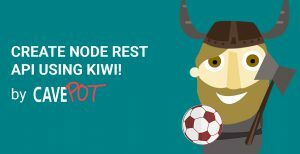 If you aren’t familiar with nodejs, I suggest that to read our post about first step with nodeJs. 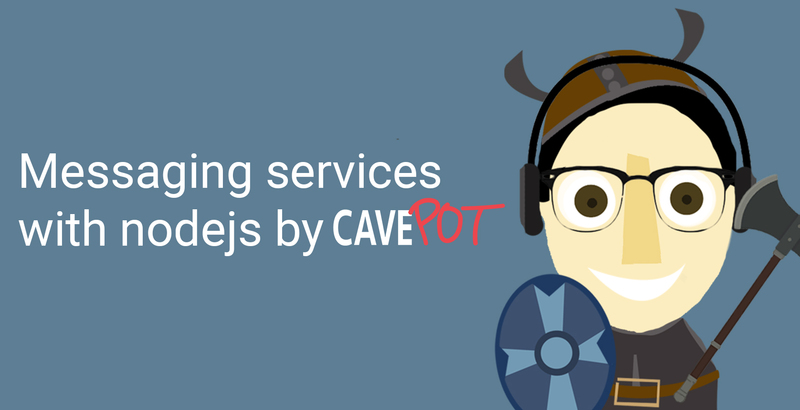 In this blog post I will share my experiences working with the most common libraries for developing the messaging services. Before we get started I would like to remind you that the node package manager, npm, offers a lot of different modules. 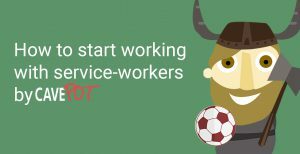 Also, in a network application you may have different endpoints with different roles that communicate in different ways. In this first part of the blog, we will see the messaging pattern publish/subscribe, in next parts. I will be showing you the request/reply and push/pull patterns. The publish/subscribe pattern, is very useful when an endpoint (publisher) needs to notify others endpoints (subscribers) messages, even if the publisher doesn’t know the subscribers. This pattern provides you with a great scalability and flexibility on your network topology. We’ll use a cross-platform library called 0MQ (Zero-M-Q), this is a very common library in order to work with messaging queue standar, provide hight-scalability and low latency messaging, it has its own event loop development model. 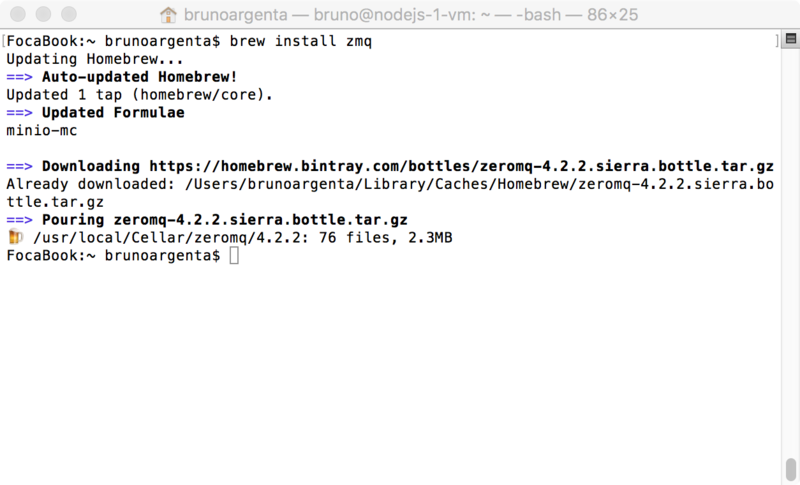 After that, you will have in your package.json the library and of course the zmq node module under node_module folder. 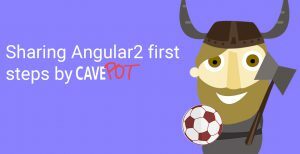 The next step is to create two new files, the first one named viking-publisher.js, the second one test.txt (only to create some event and send this event to the subscribers). What is happening with the code? Well, the first lines import the fs module (for read and write the file system) and the zmq module (the library that we imported earlier). After that, we created the publisher vik_publisher and took the argument from the command line, this argument gave us the path of the file that we wanted to watch (in our case, the file will be test.txt). The fs.watch function creates a file-system watcher, witch invokes the publisher’s send() method. Its important to know that the send() method doesn’t do any formatting of the message itself (only push bytes down the wire), it’s our job to serialise and deserialise any messages sent through 0MQ. Now, we need to implement a subscriber. The first lines of this code import the zmq library and create the subscriber viking_subscriber. Then, on the viking_subscriber.subscribe(“”) we are telling the subscriber that we want to receive all messages. 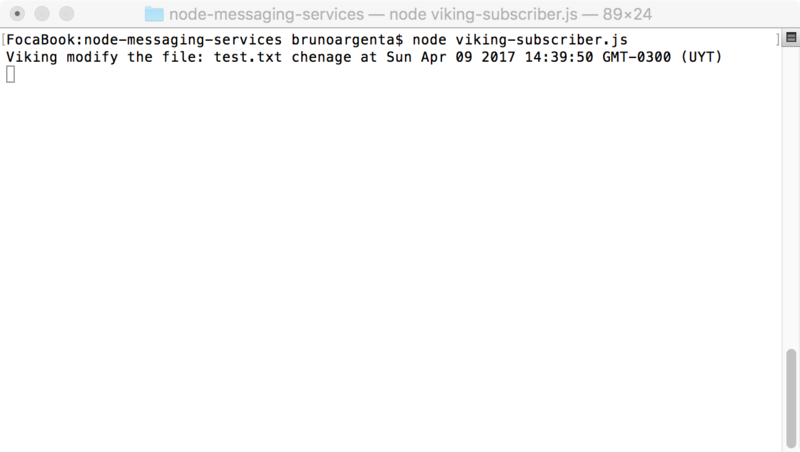 Then on the viking_subscriber.on(“message”), we are telling it how to process the message when the publisher sends it. 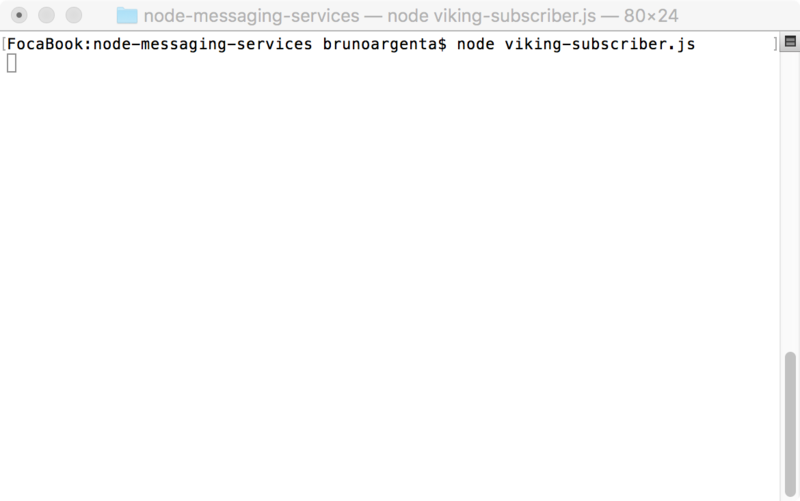 Finally, we are telling it where the publisher is with the viking_subscriber.connect(“tcp://localhost:3000”). Great! 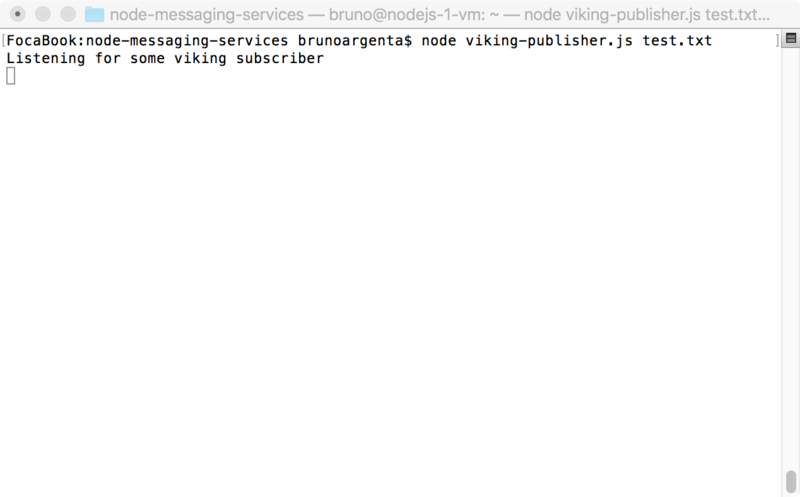 the viking_publisher.js and the viking_subscriber.js are able to successfully communicate over 0MQ socket! A great functionality of 0MQ if you kill the publisher process, is that nothing happens with the subscriber process, it waits for a message even if the publisher is down. But, when the publisher starts up again, 0MQ will automatically reconnect the endpoints. It doesn’t matter witch endpoint starts up first, 0MQ gives you a stability without a lot of work on your part. The part 2 is coming soon, stay tuned!